1. Boil pork knuckles in water. 2. When nearly boiling, remove the scum and grease from the top of the stock. 4. Add crushed garlic, peppercorns, soy sauce, vinegar and sugar. 5. Soak banana blossoms in water for 15 minutes, then add to the cooking pot. 6. Continue cooking until meat is very tender and sauce is thick. You can adjust the amount of soy sauce and vinegar to your liking. You can also use either white or brown sugar to sweeten your sauce. I use Sweet & Fit instead of white or brown sugar in my pork humba. Sweet & Fit is an excellent sugar replacement as it does not impact blood sugar levels the way white sugar does, which means it’s healthier. 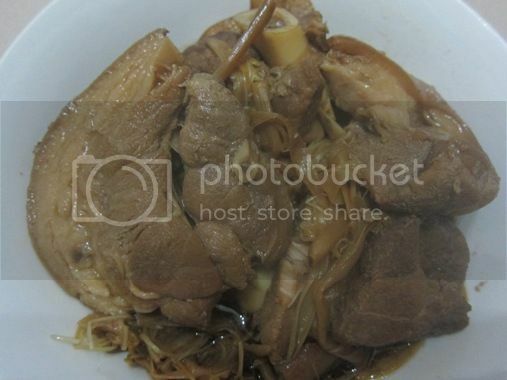 This entry was posted in Filipino Cuisine, Home-cooked Dish, Pork Humba. Bookmark the permalink. my mom wud hv love this dish! looks yummy!